A pitcher plant, cobra plant or cobra lily California is a genus of animal eating plant, the only member of the genre Darlingtonia from the family of the Sarraceniaceae. It inhabits Northern California and Oregon and grows in marshes. This plant has an unusual classification as due its natural rarity; it derives its name from the inimitable shape of its many stalks, resembling cobra heads rearing to strike. LIGHTING REQUIREMENTS: Pitcher Plants generally like bright light without much direct sun. About 50% sun or dappled shade is good. Plant lights often work well if they are broad spectrum and are kept just far enough away to prevent overheating or scorching. Thin, spindly plants or poor coloration are a sign of too weak a light. Sun burn usually appears as red or dead zones on the upper most growth, facing the sun or light. CARE INSTRUCTIONS WATER: Do not allow Nepenthes to dry out completely. They benefit from moist media and occasional flooding to wash away any accumulated salts. Use relatively clean water such as rain, distilled or purified water. Tap water can be used in many localities if the water is low in salts. Low level chlorine does not seem to be a problem. HUMIDITY: While Nepenthes often tolerate low humidity, they usually stop making pitchers. Humid environments such as greenhouses, terrariums or even tents made from sticks and clear plastic bags can provide the needed humidity. Be sure to provide some ventilation to prevent overheating and stagnant air. Many people put their plants outdoors during warm, humid weather. Some shade must be provided and bring the plant(s) indoors before temperatures drop below 50°F. TEMPERATURE: Most types thrive at temperatures between 55-95°F. Highland species such as N.burbidgeae, N. lowii, N. rajah, N. villosa and others prefer cool nights near 55-60 and days around 70-85°F. N. fusca and N. sanguinea prefer cooler, but tolerate warmer culture. The lowland types are more tolerant of warmer conditions and usually are easier to grow. This group includes: N.alata, N. eymae (infundibuliformis, eymai), N.khasiana, N. mirabilis, N. ventricosa, N. ampullaria, N. bicalcarata, N. gracilis, N. maxima and many others. Most of the available hybrids are also in this category. 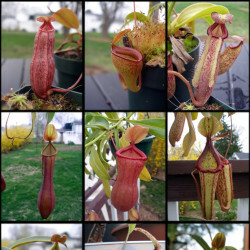 N. x 'Dyeriana,' N. x'Chelsonii,' N. x'Williamsii', N. x'Ventrata', N. x'Superba' and other hybrids are usually the easiest to grow and have been selected for colorful pitchers. SOIL: There are many porous, low-fertility mixes that work. These contain tree fern fiber, chopped fir bark, long fiber sphagnum moss, peat moss and perlite. The media should be well drained and open enough so air reaches the roots. We use unmilled sphagnum with about 40% perlite mixed in for most Nepenthes. Combinations of the above ingredients also work well. Repot if the media breaks down, the plant dries out too quickly, or plant size indicates a bigger pot. Do not use clay pots as salts tend to build up in them. Nepenthes roots are typically blackish and fine. Vibrating the container is a good way to settle the media around the roots; pushing the media down can damage these fine roots. Water well after repotting; this will also help settle the mix around the roots. We do not recommend fertilizers added to media. FERTILIZER: If you are growing the plant where it cannot catch insects for long periods, you can add an occasional small insect such as a fly, a cockroach or a few very small insects to mature pitchers. This is not normally needed. Many types benefit from 1/8 teaspoon of Miracid™ fertilizer per quart of water, this solution should be added only to the pitchers until they are 3/4 filled. There are over 1000 varieties of Peperomia Plants and most are native to Central and South America. All Peperomia Plants, which belong to the Pepper Family, are semi- succulents with very similar care requirements. The leaves of Peperomia houseplants are thick and plump, and can be rippled, smooth, or shiny. The color of the leaves of a Peperomia Plant can be various shades of green, red, gray, and cream, The pattern on the leaves may be marbled, striped, or a solid color. Peperomia Plant flowers are tiny and inconsequential, growing in clusters on upright conical spikes. When small, Peperomia houseplants can be used in dish gardens and terrariums. Compact Peperomia Plants are ideal for tables, and some varieties make excellent hanging plants. Most Peperomia houseplants never grow taller than 12”-18.” The most popular Peperomia Plants used as houseplants are the caperata and the obtusifolia varieties. LIGHTING REQUIREMENTS: Peperomia Houseplants grow well in the bright indirect light provided by a west or east- facing window. Peperomia Plants even grow under fluorescent lights. Insufficient light causes the slow growing Peperomia Plant to stop growing all together. Direct sunlight burns the leaves of Peperomia Plants. CARE INSTRUCTIONS WATER: Allow the top 50% of the soil of Peperomia houseplants to dry out before watering. Over-watering, resulting in root-rot, is the main cause of serious Peperomia Plant problems. Peperomia houseplants should be watered from the bottom. This technique keeps Peperomia Plant leaves dry and helps prevent plant diseases. The thick leaves of Peperomia Plants hold water and allow the plant to withstand long periods without moisture. FERTILIZER: Fertilize Peperomia HousePlants monthly in the spring and summer with a basic houseplant food at 1/2 the recommended strength. It’s not necessary to feed a Peperomia Plant in the fall and winter. 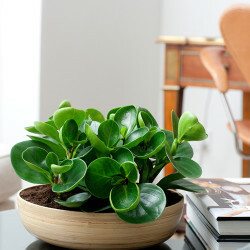 TEMPERATURE: Warm temperatures between 60-80 degrees are best for Peperomia houseplants. Temperatures below 50-55 degrees and cold drafts from windows and doors damage Peperomia Plant leaves. HUMIDITY: Peperomia Plants are originally from the rain forests of Brazil and like a warm humid environment. FLOWERING: The flowers of Peperomia Plants are very small and inconsequential. It's the leaves of Peperomia Plants that are so interesting. PESTS: Houseplant pests such as Mealy Bugs and Aphids can be a problem for Peperomia Plants. DISEASES: Ringspot, a virus that marks the leaves of Peperomia Plants with unsightly round marks, develops because of the high humidity Peperomia Plants like. Since there is no good treatment for Ringspot plant disease, damaged leaves and even the entire infected plant may have to be thrown out. Keep the leaves of Peperomia HousePlants dry and provide good air circulation to prevent Ring Spot disease. SOIL: Use a well-aerated loose potting soil that drains well for Peperomia HousePlants. If you've never grown Purple Heart Plant, you may want to add it to your collection. It's a relative of the Wandering Jew plant, and you'll find it's just as easy to grow. Bunches of rich purple, lance-shaped leaves make this a beautiful house plant year-round. Pot it in a small decorative container for an eye-catching table accent. Or, hang it in a basket and let the long, sprawling stems cascade over the side. LIGHTING REQUIREMENTS: Purple Heart Plants like bright indirect light. The better the light, the more flowers and colorful leaves the plant produces. Direct sun causes the purple and cream colors in the leaves of the plant to fade. CARE INSTRUCTIONS WATER: Water the Purple Heart well and then allow the top 2 or 3 inches of soil to dry out before watering the plant again. If the soil of a your Purple Heart plant stays too dry and the plant is in bright light, the leaves of the your plant become stunted the leaves lose color. FERTILIZER: Feed a Purple Heart plant monthly, when the plant is growing, with a water-soluble houseplant food at 1/2 the recommended strength. Using a plant food high in nitrogen helps your plant produce more colorful leaves. Over- fertilizing a Purple Heart Plant is another reason why the bright colors in the leaves start to fade. TEMPERATURE: A Purple Heart Plant grows well in temperatures between 60-80 degrees. HUMIDITY: Average to higher household humidity is best for a Purple Heart Plant. If the air is too dry, the leaf tips burn and turn brown. You can place your plant on a tray of wet pebbles to increase the humidity around it. FLOWERING: In ideal growing conditions, a Purple Heart Plant produces small white, pink, or purple flowers. PESTS: Although Purple Heart Plants are fairly pest resistant, Aphids, scale, and Mealy Bugs can be a problem. DISEASES: The high humidity Purple Heart plants prefer encourages fungal and bacterial infections. SOIL: The soil for a Purple Heart Plant should be well- aerated soil that drains quickly. If the soil in the pot of your Wandering Jew plant seems too heavy and clay-like, add some peat moss and perlite. Peace Lily Houseplants are beautiful indoor houseplants with large, glossy, oval, dark green leaves and impressive white “spathes” (flowers) that last for weeks. Spathes may be green, which reminds us that they are really modified leaves. A Peace Lily or Spathiphyllum originated in tropical forests around the world where it grew close to the forest floor in the shade of the larger plants. This helps explain why Peace Lily houseplants are one of very few indoor plants that can bloom even in medium to low light. NASA lists Peace Lily Houseplants as one of the best plants to clean the air of harmful toxins such as benzene, formaldehyde, and carbon monoxide. LIGHTING REQUIREMENTS: Peace Lily houseplants do well in low, medium, or indirect bright light. Too much light causes the leaves of Peace Lily plants to fade and lose their vibrant dark green color. Too little light and Peace Lily houseplants can’t develop flowers. Direct sunlight burns the leaves of Peace Lily houseplants. CARE INSTRUCTIONS WATER: Allow the top 50% of the soil to dry out before watering Peace Lily houseplants. If a Peace Lily Plant severely droops, yellow leaves appear once it’s watered. Over-watering a Peace Lily plant causes the leaves to turn brown. FERTILIZER: Fertilize Peace Lily houseplants every other month when the plants are actively growing with a basic houseplant food at 1/2 the recommended strength. Giving a Peace Lily houseplant too much fertilizer causes brown leaf tips. TEMPERATURE: Peace Lily houseplants grow well in 65-85 degree temperatures. HUMIDITY: Peace Lilies like a humid environment. FLOWERING: As Peace Lily Plants mature, they produce more flowers. Brighter light also encourages more blooms on Peace Lily houseplants. PESTS: Peace Lily Plants are prone to the following houseplant pests: Aphids, spider mites, and Mealy Bugs. Spraying with the green solution not only gets rid of these houseplant pests, it also removes dust and improves the appearance of the leaves of a Peace Lily Plant. DISEASES: Since Peace Lily houseplants prefer a humid environment, Leaf Spot, and other bacterial and fungal plant diseases can be a problem. Keeping the leaves of Peace Lily plants dry, providing good air circulation around the plant, and avoiding overly wet soil helps prevent plant diseases. SOIL: Use a rich well-aerated potting soil that contains a good amount of peat or other organic material for Peace Lily houseplants. A Podocarpus is a very dense, upright, slow growing evergreen plant that originally came from China and Japan. It has long slender dark green leathery leaves. A Podocarpus grows straight up with very little side branching unless it is actively pruned. This plant is relatively simple to care for and adapts well to various conditions. It is easily trained to be a bonsai or a topiary. When planted outside in the ground a Podocarpus grows quite large, but when used indoors or on the porch as a potted plant, it remains a small tree or shrub. LIGHTING REQUIREMENTS: A Podocarpus requires very bright indirect light. If it is not getting enough light the lower needles on the branches become large and elongated. CARE INSTRUCTIONS WATER: Keep the soil moist but not soggy; allow the top two inches to dry out before watering. Brown leaf tips or gray needles indicate over- watering. FERTILIZER: Feed a Podocarpus every two weeks in the spring and summer when it is actively growing. Use a plant food that is designed for acid loving plants such as Miracid at 1/2 the recommended strength. TEMPERATURE: Podocarpus prefer cool temperatures between 50-75 degrees. HUMIDITY: These plants do best in medium humidity. If your home is very dry, especially in the winter, set a small humidifier near your Podocarpus or place it on a bed of wet gravel. Be sure the plant is sitting on the gravel and not in the water. FLOWERING: The flowers of this plant are very small and inconspicuous. PESTS: Podocarpus are susceptible to Mealy Bugs and scale. DISEASES: Although the soil should be kept somewhat moist, over watering leads to root rot. sooty mold is another disease that can infect a Podocarpus. SOIL: Use a well-aerated acidic soil. Add perlite or sand if your soil seems too heavy or clay-like. A Polka Dot Plant is a small colorful houseplant, native to Madagascar, usually comes in 2, 4, or 6 inch pots. The delicate downy green leaves of a Polka Dot Plant Plant, or Hypoestes, are covered in spots and splashes of red, rose, white, or light green. 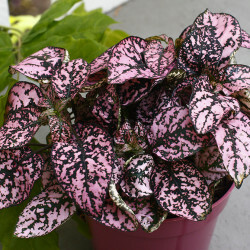 Some new varieties of Polka Dot plants even have pink leaves with green patches. When planted outside, a Polka Dot plant, can grow as tall as 30.” Inside, this plant needs to be kept trimmed back and small or it will get quite leggy. A Polka Dot plant looks beautiful in dish gardens or in small decorative containers. LIGHTING REQUIREMENTS: A Polka Dot Plant, Hypoestes, grows best in bright indirect light. Too much light or too little light causes the colors in the leaves of this plant to fade. CARE INSTRUCTIONS WATER: Water a Polka Dot plant well and then allow the top 25% of the soil to dry out before watering again. Over-watering causes root rot. If the leaves of a Polka Dot droop, they quickly perk up after a little water. FERTILIZER: A Polka Dot grows quickly. Feed it monthly with a basic liquid houseplant food at ½ strength when it’s growing usually in the spring and summer. During the fall and winter, fertilize a Polka Dot every other month as long as it’s producing new leaves. TEMPERATURE: Polka Dot plants prefer warm temperatures around 75 degrees. HUMIDITY: A Polka Dot Plant grows best in high humidity. FLOWERING: Polka Dots have small inconsequential flowers compared to their dramatic leaves. PESTS: The colorful leaves of a Polka Dot may attract whiteflies, Aphids, and Mealy Bugs; use the green solution at ½ strength to get rid of these infestations. Over watering causes powdery mildew. DISEASES: The colorful leaves of a Polka Dot may attract whiteflies, Aphids, and Mealy Bugs; use the green solution at ½ strength to get rid of these infestations. Over watering causes powdery mildew. SOIL: This plant likes a rich airy peat-based soil that drains well. A Lady Palm is an elegant durable palm that can adapt to almost all conditions. The best variety to use as a houseplant is the Rhapis Excelsa. This slow growing palm has large shiny dark green fronds with blunt tips. The fronds of a Lady Palm grow out of multiple sturdy stems that are covered in a hairy brown fiber. When potted in a 6” or 8” container, this compact upright palm makes a great table plant. In a 10” or larger pot, a Lady Palm can grow up to 14 ft. tall. A Rhapis Palm is quite pricey but well worth it when you consider that it is a slow grower, has a long life span, demands little in the way of care, and is a beautiful addition to any decor. LIGHTING REQUIREMENTS: A Rhapis Palm grows best in bright indirect light but can adapt to lower light. CARE INSTRUCTIONS WATER: Allow the top 50% of the soil of a Rhapis Palm to dry out before watering. A Rhapis, like many palms, is sensitive to chlorine, fluoride, and boron in the water. If these chemicals are present allow the water to sit for 24-48 hours before using it or use distilled water. Consistent over-watering causes root rot. FERTILIZER: Rhapis palms are slow-growing plants that need very little fertilizer. Feed a Lady Palm every other month with a basic houseplant food at 1/2-1/4 the recommended strength only when it's actively growing. If the fronds start to look a little yellow add an extra feeding to your schedule. TEMPERATURE: The Rhapis Palm can adapt to temperatures between 20-100 degrees so it is well-suited to any home or office. HUMIDITY: Lady Palms can adjust to both dry and humid environments. PESTS: If your Rhapis Palm gets spider mites or scale, the insects tend to hide under stem coverings and are difficult to reach with sprays. A systemic insecticide works better on Lady Palms. SOIL: Plant a Rhapis in a well-drained dense soil and add additional humus if needed. African Violet soil works well. If the soil appears heavy and isn't draining quickly, add sand. Often called an Airplane Plant, a Spider Plant is a fast- growing sitting or hanging houseplant that originally came from South Africa. This graceful interior houseplant produces leaves directly from the center of its pot. When kept root-bound, a Spider Plant sends off numerous long stems with baby plants at the end that can easily be used for propagation. Spider Plants are available with green leaves, green leaves trimmed in white, or white leaves trimmed in green. All Spider Plants are easy to care for and fun to have. A Spider Plant is inexpensive and a great choice for novice plant lovers. An added plus, Spider Plants clean the air of harmful toxins. LIGHTING REQUIREMENTS: Spider Plants like medium to bright indirect light. Solid green Spider Plants need less light than variegated Spider Plants. No Spider Plant should ever be put in the direct sun. CARE INSTRUCTIONS WATER: The top 50% of the soil of the soil in a Spider Plant pot should dry out before you water. A good way to tell when a Spider Plant needs water is to look at the leaves. The green color in the leaves of a Spider plant starts to fade when the soil is dry. Water high in salts and chemicals causes brown tips on a Spider Plant. Never use water that had passed through a water softener for a Spider Plant. FERTILIZER: Fertilize a Spider Plant once a month with a balanced plant food at 1/2 the recommended strength. Spider Plants need food only when they are actively growing. Feeding a Spider Plant too often causes the tips of the leaves to turn brown. TEMPERATURE: A Spider Plant does well in temperatures between 45 to 80 degrees. HUMIDITY: Spider Plants prefer high humidity but still do well in most homes and offices. FLOWERING: A Spider Plant produces very small inconsequential white flowers at the ends of long stems. Spider Plant flowers are usually followed by the development of “baby spider plants.” PESTS: mealy bug, spider mite, scale, and Aphids are plant pests that can infest Spider Plants. Spraying a Spider Plant monthly with the green solution helps prevent houseplant pests. DISEASES: Spider Plants are rarely bothered by plant diseases. SOIL: Spider Plants grow well in a good organic houseplant soil. An African Violet soil is very good for Spider plants also. 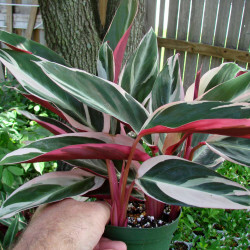 The Stromanthe sanguinea is a wonderful plant to grow as a houseplant. It is a native plant in Brazilian rain-forests. Being a member of the prayer plant family, the leaves fold up as if in prayer. The dark green leaves are variegated in shades of pink, red, white, or green. 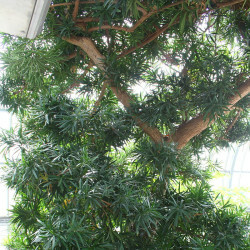 Indoors, it can grow to a height of 60 to 90cm (2-3 feet), but grown outdoors, this plant can easily reach to 1.5m (5 feet). They produce reddish-pink flowers in spring. LIGHTING REQUIREMENTS: Place a Stromanthe Plant in bright indirect light but no direct sun, a north or east facing window is best. CARE INSTRUCTIONS WATER: A Stromanthe Plant likes to be kept barely moist at all times. Be careful not to over-water a Stromanthe or the roots rot and the plant dies. In winter, allow the soil of a Stromanthe to dry out a little more, but never completely. FERTILIZER: Feed a Stromanthe every two weeks when the plant is producing new leaves, ususally from early spring to the end of fall. Always dilute the plant food for a Stromanthe to 1/2 the recommended strength. TEMPERATURE: Avoid placing a Stromanthe in a cold or hot draft, otherwise basic household temperatures are fine. HUMIDITY: A Stromanthe needs high humidity to keep its beautiful leaves looking good. If your house is dry, you need to place a Stromanthe on a wet pebble tray. Be sure the plant is sitting on the pebbles and not in the water. Stromanthe Plant leaves turn brown and become crisp when the air is too dry and the plant quickly disintegrates. FLOWERING: A Stromanthe sanquinea produces reddish-orange flowers in the Spring. PESTS: Aphids are a plant pest problem for a Stromanthe and, if the humidity is very low, spider mites move in. DISEASES: The high humidity a Stromanthe plant requires encourages fungal plant diseases. SOIL: Use a light, quick-draining soil for a Stromanthe Plant, that retains moisture but drains well. A peat based potting soil is a good choice for a Stromanthe. A Sansevieria Plant, originally from South Africa, is another hardy almost impossible to kill houseplant that thrives on neglect. Sansevieria Plants, also called Snake Plants and Mother in Law’s Tongue Plants, can be used as table plants or, when taller, stately floor plants. Certain varieties of Sansevieria Plants, such as the “Trifasciata” have long, thick, stiff, upright leaves that can reach 4ft. in length while other varieties, such as the Hahni Sansevieria, have very short compact leaves that are only 4”. NASA lists the Sansiviera Plant as an excellent clean air plant. LIGHTING REQUIREMENTS: A Snake Plant can be placed anywhere in a room from the darkest corner to next to the brightest window. The better the light, the faster a Sansevieria Plant grows. CARE INSTRUCTIONS WATER: Over-watering is the only way to kill a Sansevieria Plant. Always allow the soil to completely dry out before watering Snake Plants. During the winter, in a low light area, a Sansevieria Plant needs water only once a month. When in doubt, do not water Sansevierias! FERTILIZER: Feed a Snake Plant monthly when the plant is actively growing with a Cactus Plant food at 1/2 the recommended strength. Never use a fertilizer that contains nitrates on a Sansevieria Plant. TEMPERATURE: Snake Plants grow well in temperatures between 60 and 85 degrees. HUMIDITY: Sansevieria Plants prefer low humidity. FLOWERING: Snake Plants may produce flowers ever few years during the summer months. Flower production on a Sansevieria Plant occurs when the plant is sitting in bright light and when the plant is experiencing some stress. Stress provoking conditions for a Sansevieria Plant would be severely dry soil or very root-bound. The flowers of a Sansevieria Plant, which appear as clusters on long spikes, are fragrant but not particularly pretty. PESTS: Snake Plants are quite immune to houseplant pests. DISEASES: Snake Plants are also quite immune to Houseplant diseases. SOIL: Sansevieria Plants like good rich organic soil that drains quickly. If the soil in the pot of Snake Plant isn't draining well, add some sand to it. Schefflera houseplants, native to Australia, New Zealand, and the Pacific Islands, are often called Umbrella Trees because of their large, shiny, dark green leaves that drape down like the spokes of an umbrella. Each Schefflera leaf grows at the end of a long stem and consists of several smaller leaflets. Schefflera Plants usually have multiple trunks. The newer Amate variety of the Schefflera Plant, which is grown from a tissue culture, has larger glossier leaves. A Schefflera Amate houseplant requires less light, is more resistant to spider mite, has a better developed root system, and is very symmetrical and full. A Schefflera Amate Plant is a little more expensive than a regular Schefflera Plant, but well worth the extra cost. LIGHTING REQUIREMENTS: Schefflera houseplants do well in medium light, but grow faster and develop more leaves in bright indirect light. The Schefflera Amate variety needs less light than regular Schefflera houseplants. CARE INSTRUCTIONS WATER: Allow the top 25-30% of the soil to dry out before watering Schefflera houseplants. Green leaves drop off and new growth turns black when Schefflera Plants are over-watered. Yellow leaves indicate a Schefflera houseplant is being under-watered. FERTILIZER: Fertilize Schefflera houseplants monthly in the spring and summer when they are actively growing with a basic houseplant food at 1/2 the recommended strength. During the fall and winter feed Schefflera plants every other month but only if the plant is producing new leaves. 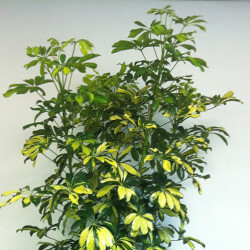 TEMPERATURE: Schefflera houseplants prefer temperatures between 65-80 degrees. Schefflera Plants do not do well in temperatures below 55 degrees and should be kept away from cold drafts and heaters. HUMIDITY: Basic household humidity or higher is fine for Schefflera houseplants. If the air is very dry, place your Schefflera Plant on a tray of pebbles and water. Be sure the plant is sitting on the pebbles and not in the water. PESTS: Schefflera Plants are bothered by these houseplants pests: spider mites, Mealy Bugs, Aphids, scale, and Fungus Gnats. Insect prevention is always easier than treatment so examine the leaves of Schefflera houseplants every time you water. DISEASES: The houseplant diseases Leaf Spot and powdery mildew develop if the soil of a Schefflera Plant stays too wet or water frequently gets on the leaves. SOIL: Use a well-aerated fast-draining indoor potting soil for Schefflera houseplants. A Hawaiian Ti Plant, Cordyline terminalis, is one of the most colorful foliage plants you can purchase. The cane-like woody stems of a Hawaiian Ti Plant produce sword-shaped leaves 2′-5′ in length and 5”-7” wide. Ti Plant leaf color can be maroon, purple, rose, yellow, pink, green or a mixture of these colors. Hawaiian Ti plants, originally from Eastern Asia and Polynesia, are also referred to as Good Luck Trees. When young, a Ti plant is a beautiful table plant. As it matures, these beautiful plants becomesan exotic looking floor specimens. There are quite a few similarities between a Hawaiian Ti Plant and a Dracaena. There is one major difference between these two houseplants, a Dracaena is an easy care plant while a Ti Plant requires quite a bit of extra care. A Hawaiian Ti Plant is not a good plant for someone just starting to care for houseplants. LIGHTING REQUIREMENTS: A Hawaiian Ti Plant requires bright indirect light, but no direct sun. CARE INSTRUCTIONS WATER: Proper watering is the most difficult part of taking care of a Hawaiian Ti Plant. The soil of a Ti Plant must be moist but never soggy and should never totally dry out. Use bottled water for a Ti Plant if your regular water contains fluoride, chlorine, or passes through a water softener since chemicals damage the leaves of a Ti Plant. FERTILIZER: Feed a Ti Plant monthly in the spring and summer with a liquid or slow release plant food at 1/2 the recommended strength. Never use a fertilizer that contains fluoride on a Hawaiian Ti Plant. TEMPERATURE: Ti Plants can handle temperatures from 65-85 degrees. Be careful to keep a Hawaiian Ti Plant away from drafts and heating vents. HUMIDITY: High humidity is necessary to keep the leaves of a Ti Plant looking good. PESTS: Ti Plants attract numerous houseplant pests such as: Fungus Gnats, Mealy Bugs, spider mites, scale, and thrips. A bad infestation of spider mites is often the reason the color in the leaves of a Ti Plant look faded. Spray your Ti Plant with a soapy water solution and keep the leaves dust free to help prevent both houseplant pests and houseplant diseases. DISEASES: Spots of the leaves of a Ti Plant may be due to a fungal infection such as Leaf Spot. Treat your Ti Plant with a fungicidal spray. Spray the plant with an insecticide treatment to control and eliminate any insect infestations. Be sure to rinse the foliage and allow it to dry before applying the spray. SOIL: Use a loose, well-aerated fast-draining potting soil for a Hawaiian Ti Plant.